Five decades ago the state’s political power brokers spent over nine months together and painstakingly hammered out a new constitution for Illinois. The new constitution would bar lawmakers from taxing millionaires at a higher rate than other taxpayers. 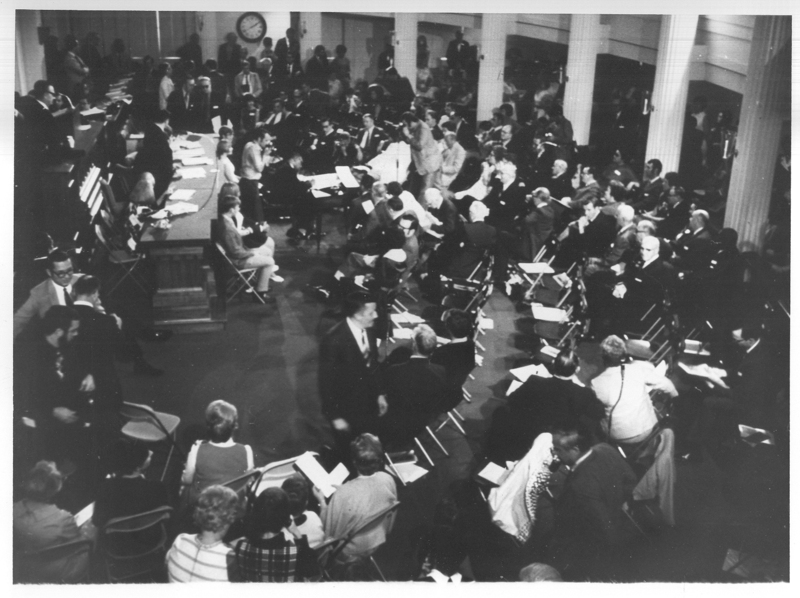 Delegates listen to debates during the 1970 Constitutional Convention. Today, Illinois power brokers are betting the state’s financial future that voters will agree to change that constitution to allow for a graduated income tax to help pay off billions of dollars in debt and deal with a massive pension crisis. House Speaker Michael J. Madigan will have played a role in both landmark situations. And he tells the Center for Illinois Politics that he has been reminiscing about his work as a delegate to the Constitutional Convention, even going so far as to recently study the 1970 constitution referendum tallies, ward by Chicago ward. Madigan was just 28 when he worked on the constitution, a backbencher still green to state politics. He had recently been elected 13th Ward Democratic Committeeman after the death of his father, a Chicago ward superintendent politically connected to Mayor Richard J. Daley. A young Michael J. Madigan in his first Illinois Blue Book photo. In many ways, Madigan said, it was a drive toward compromise that led to the current constitution banning a graduated income tax. At the time, just having a statewide income tax was new and controversial. So, one of the goals effectively for supporters was to enshrine the new income tax in the new constitution, undermining the ability of future lawmakers to convert to a progressive tax. "Most people were motivated to draft the document that would get the approval of a referendum vote,” Madigan said. 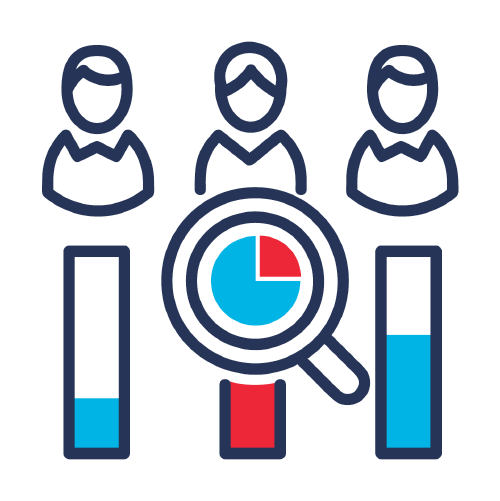 “They were prepared to do compromises and tradeoffs." The state’s antiquated 1870 constitution didn’t specifically allow for lawmakers to tax income. But shortly after the constitutional convention was authorized by voters, the Illinois legislature went on to adopt an income tax rate of 2.5 percent for individuals and 4 percent for businesses in 1969. That legislation, which had the support of Gov. Richard Ogilvie and Chicago Mayor Richard J. Daley, was ultimately upheld by the state's Supreme Court. 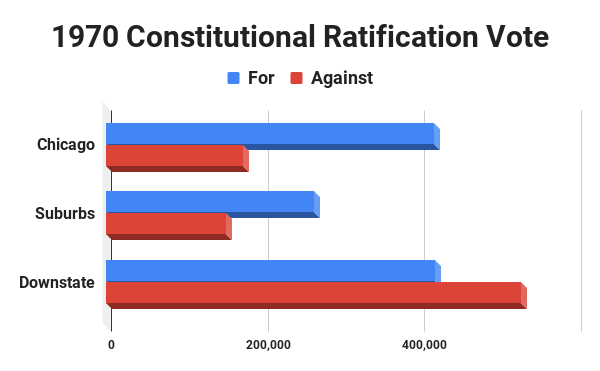 The final constitution draft put to voters solidified the newly achieved status quo -- a flat income tax that also held the rate for businesses to less than twice the rate for individuals. Madigan said lobbying efforts led by delegate Joseph T. Meek, a Western Springs resident who was also president of the Illinois Retail Merchants Association at the time, ensured the constitutional language would stop today’s lawmakers from instituting a graduated income tax without voters amending the constitution. "He was the Rob Karr of his day, and he would spend every day, almost the entire day arguing for a flat rate of the income tax," Madigan said. "He had a very persistent, but pleasant personality." Karr is president of today’s IRMA, which continues to oppose a progressive tax, spokesman Ryan McLaughlin said. An income tax wasn’t the only issue on the table, of course. Some of the questions studied, debated and ultimately approved by delegates to put before voters included the authority of towns to tax and borrow, protection of government employee pensions, voting qualifications and election of judges. 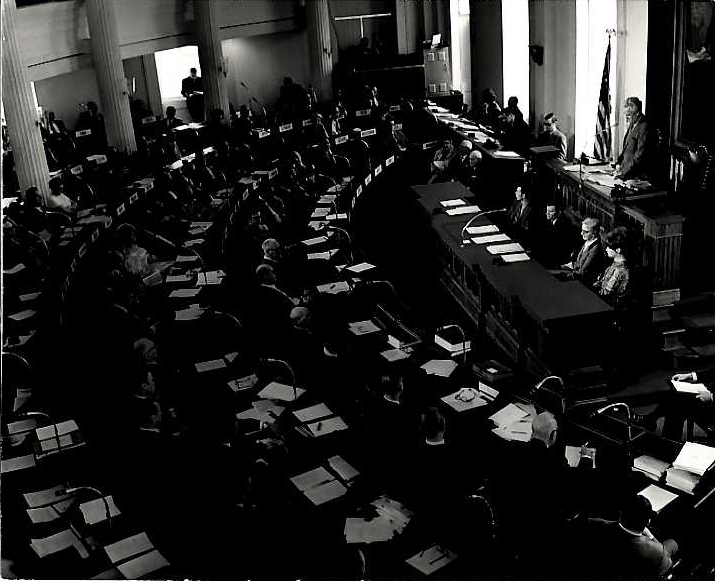 Before a December ratification vote, four hearings were held around the state, including a two-day hearing at the Merchandise Mart in Chicago. When it came time for voters to have their say, Mayor Daley swung his support behind it, largely because the constitution granted wide “home rule” authority for towns of 25,000 or more to tax and borrow. "The mayor supported the constitution for home rule power," Madigan said, noting Daley was a candidate for re-election the next spring. That was a surprise to young Madigan at the time. 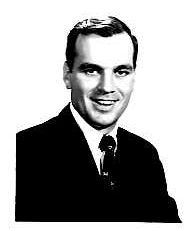 Daley's son, the future Mayor Richard M. Daley, was also a delegate. Young Daley and young Madigan had met a few years earlier, when both were law students at DePaul and Loyola, respectively. "Rich knew very well what his father's position was on all the issues," Madigan, now the state's longest serving House Speaker, recalled. "And I would know them because I was pretty friendly with Rich at the time. On most of the major issues (in the new constitution), Rich was telling me his father was going to be against them. That the mayor supported the ratification in the end, that was a surprise to me." Madigan remembers those days as a delegate as “long and tedious,” where issues had to be read and debated three separate times for approval. Recently, he said, he found himself looking at a convention seating chart. He was seated alphabetically next to Arlington Heights Republican Virginia MacDonald and Daley was several rows in front of him. Madigan said he also recently found himself looking up how various pockets of the city voted on ratification, recalling that in more conservative areas residents opposed to an income tax voted against ratification. "I pulled election results the other day. You can see in the then-conservative areas of the city, like the 13th Ward, the 19th Ward or the 14th Ward, there was a high 'no’ vote,” he said. “There were other wards that were more controlled by the Democratic organization that had huge pluralities of yes (votes)." 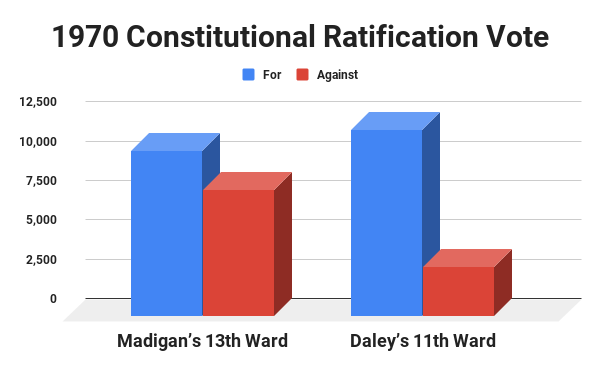 Records show that in Madigan’s 13th Ward, 10,547 residents voted for ratification and 8,021 voted against it. Compare that to the 11,831 in favor and 3,143 opposed in Daley’s vaunted 11th Ward. Breaking down Illinois vote totals by region, Chicago approved the new constitution by the widest margin: 419,846 ‘yes’ votes to 176,059 ‘no’ votes. In the independent voting suburbs, 266,118 residents were in favor and 154,299 opposed. In traditionally Republican downstate, 420,371 voted for ratification and 530,965 voted against. In all, 57 percent of Illinois voters approved the new constitution. This time around, Gov. J.B. Pritzker is selling a constitutional amendment to allow a progressive income tax as way to fix the state’s budget mess without taking money from any of the state's residents except the very wealthiest. “Under Gov. Pritzker’s fair tax, 97 percent of Illinoisans will not see an income tax increase,” declares a recent TV ad touting the plan. The plan would have those earning over $1 million a year paying 7.95 percent in income tax, a full 3 percentage points higher than the the top rate for those earning less than $250,000 annually. Pritzker estimates the change from the current flat rate of 4.95 percent would bring in an additional $3.4 billion in revenue. For Illinois to implement a progressive income tax, lawmakers would have to approve a referendum to be placed on the ballot in the 2020 general election. Note: Center for Illinois Politics’ editor Kerry Lester’s husband does legal work for Madigan’s political committees. That work, however, began more than two decades after the 1970 Constitutional Convention.